Hinged lid microtube storage box made of premium grade polypropylene. Box features a clear lid with textured sides for non-slip handling. A locking clasp helps to keep most samples in place if tipped over. Accommodates 1.5-1.7 ml microtube, standard 1.2 ml cryovials, most 1.5 ml skirted microcentrifuge tubes and 1.5mL(12 x 32mm) vials. 12.2 x 47.6mm maximum vial size. Box measures 5.64 x 6.01 x 2.07 inches. 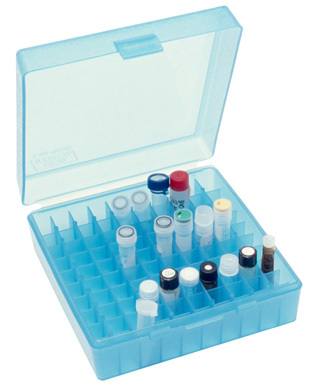 The 10 x 10 array of compartments makes it easy to organize and reduces the risk of cross contamination. Autoclavable. Box is sturdy, see-thru & stackable.